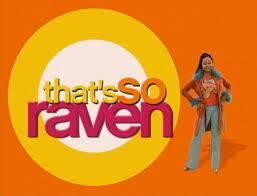 Okay, so I had never seen an episode of That’s So Raven, although I had heard of the show. So I had no idea that the main character is psychic. Yeah, she gets flashes of the future. They seem pretty useless, but there’s your premise. Psychic drama queen with misfit friends and a permanent laugh track. This episode follows a stock sitcom plot that is nearly always unpleasant. Character does something slightly dumb (opens her Christmas present early, even after her psychic powers let her know what it is), compounds it with something dumber (wears the expensive necklace to school) and finishes off with completely implausible (necklace gets flung out a window and under a lawnmower). So now that she’s “ruined Christmas”, she and her friends try replacing the necklace before her parents know it’s gone, while avoiding their evil teacher who’s moonlighting as a mall Santa. And they manage it, through slapstick and shenanigans. And there’s a few bits where it’s almost actually funny. But then. THEN. Santa shows up, ACTUAL Santa, and zaps Raven back to the point before she opened the gift in the first place, thus effectively negating the entire plot and the lesson. I mean, she remembers it, but what it means is that she doesn’t have to have spend time and money replacing the necklace, so she has no consequences besides the memory, which no one else remembers. Urgh. The little added song on the end was almost fine, but it went on too long and she milked it too much. This was overall unpleasant to sit through, although it was not the worst thing on the Disney Channel Christmas DVD.